The parts of the body we have talked about so far have been big enough to see without difficulty. This level of knowledge must have been available to people for hundreds of years, from witnessing animals being slaughtered and from seeing the results of hand-to-hand fighting on the battlefield. We have thought about the process of exploring the body by dissection, imagining that we can separate out the parts from the whole. Thus, we have identified and labelled the heart, lungs, liver, pharynx, and other structures. We have begun to associate a particular function, or set of functions, with some of these organs of the body - the heart as a pump, the larynx as a place where sounds are generated, and so on. This process of distinguishing parts in a complicated whole is a fruitful way of gaining understanding. It has also become embedded in modern science as a central method for learning about the world. It has even been given a name - reductionism. The advantage of this approach is that if you are trying to understand a very complex system, by taking it to pieces and studying each part you begin to get an understanding of how things operate within the system. There is no doubt that the reductionist approach has been valuable, but there are weaknesses in it too. At some point, having worked out what each of the parts does in isolation, it becomes necessary to fit things together again and see how they function within a complex network of interactions. This approach of looking at whole structures - the bigger picture - is called holism, and we shall have cause to take a more holistic approach later when we look at topics such as consciousness. Reductionism and holism are complementary methods, and it is only by iterating between the two that we can begin to understand how things are and how they work together. For now, we are going to take the reductionist route by asking ‘what are the organs and tissues of the body made of?’ Each organ and tissue has its own characteristic shape, colours, and textures, but beyond that we are not able to see with the unaided eye. You have probably held a magnifying glass over some text or an insect in order to see it enlarged. This single lens can make small things look larger and reveal things not previously visible, but its power is quite limited. Even so, through perseverance and the construction of some 500 single-lens microscopes the Dutch scientist Anton van Leeuwenhoek (1632-1723) was able to draw and describe bacteria in teeth scrapings and tiny single-celled organisms (protozoans) in pond water. It was discovered that by combining lenses together within a tube it was possible to produce instruments with much greater magnification - compound microscopes. Another Dutch scientist is credited with this breakthrough - Zacharias Janssen, of Middleburg, Holland. A multi-talented English scientist called Robert Hooke developed a microscope that enabled him to see box-like chambers in a thin slice of bark from an oak tree. In 1665 he introduced the word ‘cell’ to label these units. We now know that the human body is made of living cells. As time has gone by, we have come to know a lot more about cells, their structure and processes. Although they are tiny, and generally invisible to the unaided eye, they are very, very complex and capable of a wide range of subtle behaviours. Not all the cells in the body are the same. Most cells become specialised to take on a specific task. Some cells are good at shortening in length when instructed to do so - these are the muscle cells. Other cells are good at carrying signals from one place to another - these are the nerve cells (neurons) that together form the nervous system. 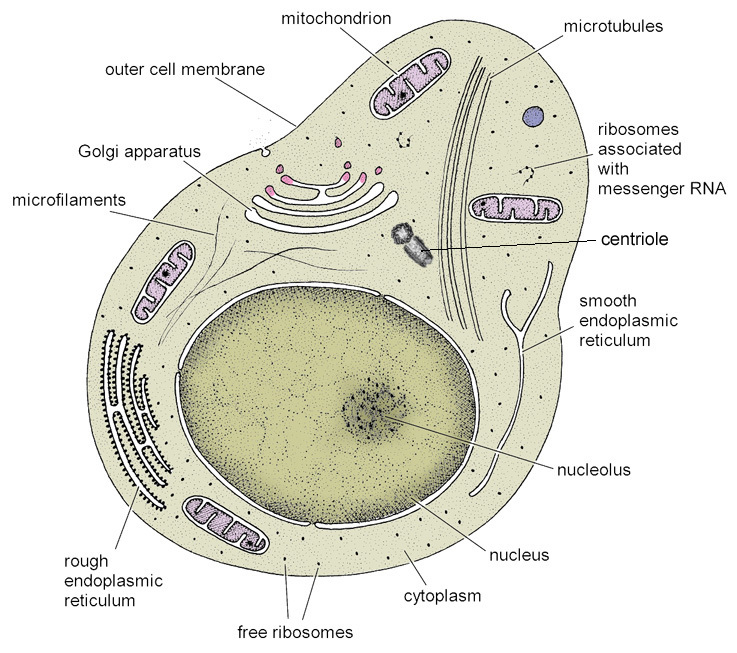 Some cells stay where they are, forming coherent sheets called epithelia. Other cells move around within the body tissues, helping to protect us against the ever-present risk of infection by organisms from outside. Some cells live within a more solid matrix as is the case with bone and cartilage. Cells with such different functions also have different appearances when viewed through a microscope. We say that the cells are differentiated. At the same time, they share many features in common with each other. There are certain components within each cell that are essential for its continued existence and well-being. We shall look at these common denominators now.